The world of management is in crisis - the old remedies no longer work and organizations are failing at an increasing rate. Although many talk of 'joined up thinking', few offer practical guidance on how to achieve this in organizations. 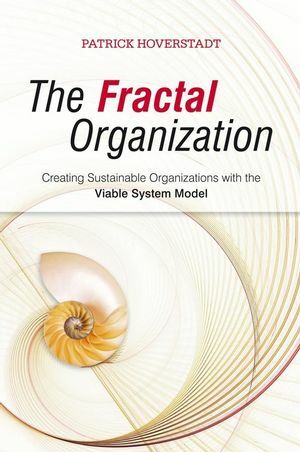 The Fractal Organization sets down the practical implications of a well tested systemic approach to building organizations that are capable of surviving and flourishing in these turbulent times. "An excellent read…Many organizations fail at the mercy of their own ignorance. The author has done an excellent job in making ‘the science of effective organization’ accessible to management, providing them with a new knowledge to deal with the uncertainties that the markets place upon them." "...one of the most interesting, thorough and rigorous guides to management that I have ever read, … introduces new insights in every chapter… carries a credibility which acts as a counterbalance to the sometimes difficult message which he conveys which is that a lot of mainstream management practice is at best ineffective and at worst downright destructive. I would recommend this book to anyone interested in management or systems thinking." "In my opinion this book manages to present sound academic theory that is relevant and helpful to the practitioner in the business. I experienced several A-HA moments." "The insights of the Viable System Model have been open only to a select few for much too long. Hoverstadt has gone furthest in bringing these ideas to a wider audience…Management books have too often been serious but not practical, or practical but not serious. This book is both brilliantly serious and practical, and often entertaining too." "Integrates mainstream management ideas with the systems ideas underpinning the VSM, and flows and reads well. As a starting point for developing understanding of the VSM in today's world this book improves greatly on all books that have gone before, I would certainly recommend it to colleagues, clients, and students." Patrick Hoverstadt is a practicing consultant with a wealth of experience over the past ten years of applying VSM in analyzing and designing organizations for clients. He is a visiting lecturer at Manchester Business School, a visiting Research Fellow at Cranfield School of Management and a regular contributor to conferences and journals. A paper he wrote was awarded an Emerald publications "literati club" prize for clear presentation of difficult concepts. He is currently chairman of "Cybernetics North" a NW based group of systems practitioners and has access to the support and experiences of group members to draw on for further material. Chapter 1 The Crisis of Organization. Chapter 2 Management Myths, Models and Self-Fulfilling Prophecies. Chapter 3 Overview of the Viable System Model and the Rest of the Book. PART 2 Running the Business. Chapter 4 Autonomy and Control. Chapter 5 The Structure of Value Creation. Chapter 7 Organizational Cohesion – The Structure of Managing Performance. Chapter 8 Organizational Integrity and Monitoring for Trust. Chapter 9 Performance and Viability. PART 3 Changing the Business. Chapter 15 Identity and Purpose. Appendix The Process of Modelling. Each area mentioned will be illustrated by case material. Alternative approaches will be provided as guides for teaching use.